When it comes to contractors serving Baltimore and surrounding cities in Maryland, you will be hard-pressed to find one with more skill and experience than Roland Slate Service Company. We were founded in 1989, and since then we have served homeowners and businesses in the area by offering top-of-the-line roofing products and expert installation services that are second to none. 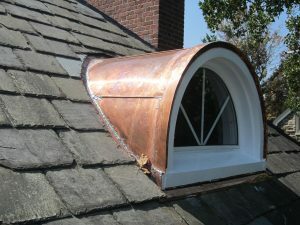 Some roofing contractors are out to make a quick buck off shoddy work, we take pride in our old-fashioned craftsmanship. Our numerous industry awards speak to our integrity and customer service, such as the Better Business Bureau’s Torch Award and the Governor’s Award for Business Ethics. Roland Slate Service is a family-owned and -operated company, and as such we are able to provide a level of personalized service that many roofing contractors serving the Baltimore, MD, area cannot. We take the time to sit down with you and discuss your needs and budget so that we can determine which of our many roofing systems is right for you. Slate – Natural or synthetic slate is great for preserving the classic charm of buildings in historic districts. Asphalt shingles – Durability and beauty make traditional shingles a common choice for homeowners. Copper – Our copper roofing is precisely fabricated by our seasoned mechanics to seamlessly fit the dimensions of your home. Metal – Available in flat seam and standing seam, our metal roofing is engineered for maximum durability. Spanish tile – Tile is perfect for adding a unique flair to any home or business. Cedar shake – This style can give your home a rustic look that will be the envy of the neighborhood. No matter what type of roofing you choose, you can be sure that it will be installed with care and precision by our highly trained roofing technicians. And, unlike other roofing contractors who use subcontractors to complete their work, all of our roofing contractors are employees who have undergone our proprietary training to equip them with the knowledge and skills they need to do the job the right way. To learn more about what sets us apart from other roofing contractors, contact Roland Slate Service today and set up a free consultation at your home in or around Baltimore, MD.